Upstairs: kitchen, dining room (seats 8), living room with fireplace & 37' flatscreen TV, DVR, DVD, VCR & CD player, deck with gas grill, king bedroom and full bathroom. Downstairs: living room with Foosball table & 32' flatscreen TV, PlayStation ,VCR, and DVD, two queen bedrooms, one double bedroom, laundry and full bathroom. Our home is child friendly and includes a baby gate. This house is situated on 1.5 private wooded acres. Outside there is a large driveway with plenty of parking and a basketball hoop. Please be aware that out house is strictly non smoking and no pets allowed. Mount Cranmore is right down the road. We offer discounted ski & tubing passes. The Cranmore Family Fitness Center has indoor tennis courts. 1 king, 2 queens & 1 double. DVD players; baby gate; basket ball hoop; foosball. Great place to stay. Perfect for any family. Clean house. Fully stocked kitchen. Fantastic location. Great home close to shops, skiing, restaurants. Very private. Living room with fireplace and family room so families have plenty of space to relax and play! We had a wonderful stay and will definitely be back. Thank you for a fabulous place to stay during our ski weekend. Thanks for being multi-season “regular” with us. We’ll always welcome you back to Woodland Chalet. We had a great family ski weekend at Jo Ann's Chalet. We found it comfortable, close to everything we wanted to do from skiing at Cranmore to enjoying Main St. N. Conway, and very-well appointed. The kids especially liked the second living room with games! We love tucking ourselves into the snowy woods, skiing all day, and then falling asleep to movies by the fire. This house is perfect for kids movie and playtime in the cozy downstairs living room and adults upstairs by the fire. We ate at Zip's pub watching the fireworks at Cranmore and skied Attitash and Wildcat. It was a perfect weekend getaway. We LOVE North Conway! We’re always happy when families enjoy our mountain house, especially when they notice the advantage of a separate TV/play room for the kids. Whether 1 family or 2, this place has all you need for great ski vacation. We are a family of 5 with kids under 7yo. Cranmore mountain is an excellent resort for young families. So, to have a rental so close to Cranmore as well as the 302 strip was a winter delight. Abundant firewood and beautiful scenery also make this property sing. We plan to check it out during the summer season. Serene Setting just 2 minutes from Cranmore!!! We thoroughly enjoyed our stay! The master bedroom is upstairs overlooking the woods. There is also a well appointed kitchen and living area with a lovely fireplace on that level which provides for a great area for parents to unwind after the kids have gone to bed in the "kid area" downstairs. Downstairs there are three bedrooms, a full bath and living area with a foosball table. The kids enjoyed having their own space and so did we. We will most certainly return! Thank you for a wonderful stay! We love having happy families at our house and hope to host these guests again. They could not have been better tenants. Discounted tickets to Mount Cranmore (skiing, tubing and rec center), Wildcat & Attitash! 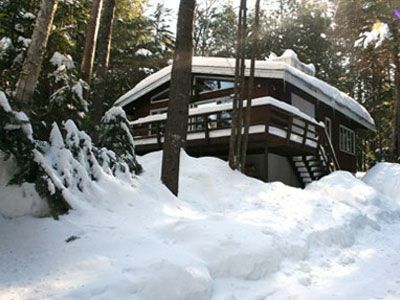 North Country activities include: skiing, hiking, climbing, swimming, canoeing and outlet shopping. Attractions for the entire family include: winter sports, golf, mini-golf, alpine and water slides, mountain biking, and scenic train rides, as well as fine dining, theater, and night life. Day passes for the Cranmore Family Fitness Center (sauna, gym, fitness classes and more) are available at half price! The cleaning and laundry fees include beds made up with sheets prior to your stay, laundering of all sheets and towels after your stay, as well as house cleaning after your stay (up to $75).